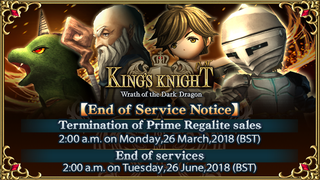 Square Enix is ending service for mobile game King’s Knight: Wrath of the Dark Dragon this June. Square Enix is ending service for mobile game King’s Knight: Wrath of the Dark Dragon this June. “We would like to express our sincerest apologies for ending the service but we hope you have enjoyed your time with the game,” the company said via Twitter.